I’ve been sent one of these iGotU GT600 GPS Travel and Sports Logger gadgets to take a look at. It’s a GPS unit that records your position while you explore the world or jog the track. When you get home, download the GPS data and you can use it to map your route or to geotag your photos if you sync your camera clock with it. While there are a million phones and apps out there that can do both of those things, anyone who’s left their GPS and mapping software running will know what it does to your phone’s battery life. The GT600 is a completely dedicated unit that’s designed to be as easy to use as possible and is completely forgettable while you’re out and about. The results are fantastic, read on to see why. The GT600 is powered by a SiRF Star III, low power GPS chipset and the 64MB of RAM allow it to record 262,000 waypoints. The battery is a (relatively) huge 750mAh battery and Mobile Action reckon it can keep running for 80 hours, recording a waypoint continuously every 15 seconds. Or if you use it for 6 hours a day the battery should last for 2 weeks or until the memory fills up. Best of all, when you stop moving the thing switches off automatically, and then powers back up when you head off again. It’s light too, without it’s soft gel protective case it weighs a negligible 37g (3.25oz). It comes with trip recording software (@trip), sports logging software (SportsTracker) and a very basic “Where am I?” app, that will display your current location if the GT600 is plugged into your PC. It’s a very nice looking product and there’s nothing on the logger except a button and a proprietary charging port. It comes with a proprietary USB cable, software, wrist strap and a protective gel case. There’s also a lanyard loop similar to the ones found on cell phones so you could conceivably wear the thing around your neck. The unit is weather resistant, hence the proprietary cable connection, but Mobile Action stress that it’s not waterproof. There’s one button that turns the unit on and off, and if you give the button a quick press while it’s on it will log a waypoint which shows up in the software. Like all GPS units, it needs an unobstructed view of the sky so it needs to be somewhere high on your person or maybe in the top of your bag, facing upwards. Those seem to be the only instructions for use. 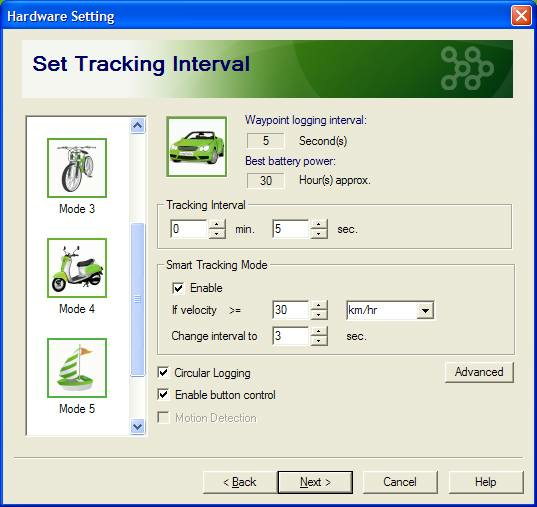 The unit has some internal smarts that can only be adjusted using the included @trip software. 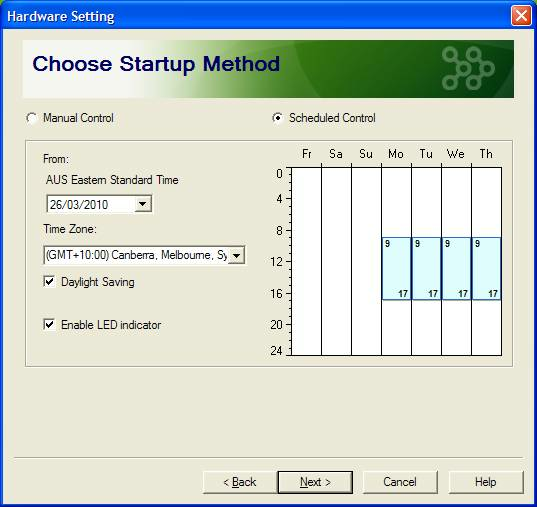 You can choose either manual control of the unit, or you can program it like a VCR to switch on or off and you can choose the duration as well as the date. There is also a choice of six usage modes; walking, running, cycling, city driving (motor scooter), sailing and highway driving (car). You can set the recording interval separately for each usage mode, but there’s also a smart mode that’s velocity-sensitive. The upshot being if you go fast, the recording interval can be increased to improve the resolution. You can also turn off the motion detection and enable circular logging, which will just keep writing data to the memory, if it fills up, it returns to the beginning overwriting the oldest data first. You can export the data either as a .csv or .gpx file so you can use it with other software. There’s also the option to upload your trip to the net, via the @trip website. You can upload your route and any photos you took and where you took them so friends and family can enjoy the journey as well. Apart from recording where you’ve been the other main feature of the GT600 is geotagging. Geotagging is the addition of GPS coordinates to the metadata of photos and while it’s undoubtedly a useful feature, if you don’t have a GPS unit with you when you take the photo, it’s a pain in the neck to tag them by hand later on. To geotag with the GT600 you just need to sync the date and clock in your camera with the clock inside the GT600, via the @trip software. Once that’s done you’re all set to go travelling. 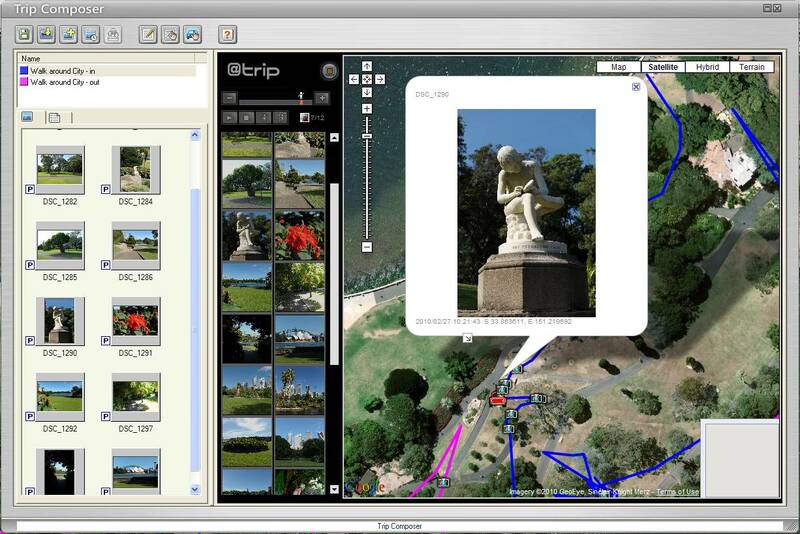 After you’ve recorded your trip, you can import your photos into the @trip software and it will automatically tag them according to the time they were taken and display them on the map of your travels. The map is generated via Google Maps, but the data in the photos also works with Bing Maps and Yahoo! Maps. What’s more the data is written to the photo’s metadata and thus anything you open the photo with that can read the GPS data will display it for you (Facebook, Flickr, Picasa etc). This is very cool. I bought my i-gotU tracker last year and I absolutely love it! I have the GT120 model but the basic functions are the same. You can use it to track where you have been and project the stored data onto a map of the earth. You can, if you wish, share these trips with friends, family and/or the general public. Photos can be attached to a route and the software will show on the map exactly where each photo was made. Look athttp://www.a-trip.com for examples. They also deliver – absolutely free of charge – software that can be installed to your windows mobile smartphone and use the phone's inbuilt or bluetooth GPS receiver to do just about the same but it won't record as long as one of these standalone trackers because your phone battery won't hold out that long. Doh. I completely forgot to mention the uploading. Thanks Phillip I'll add it.